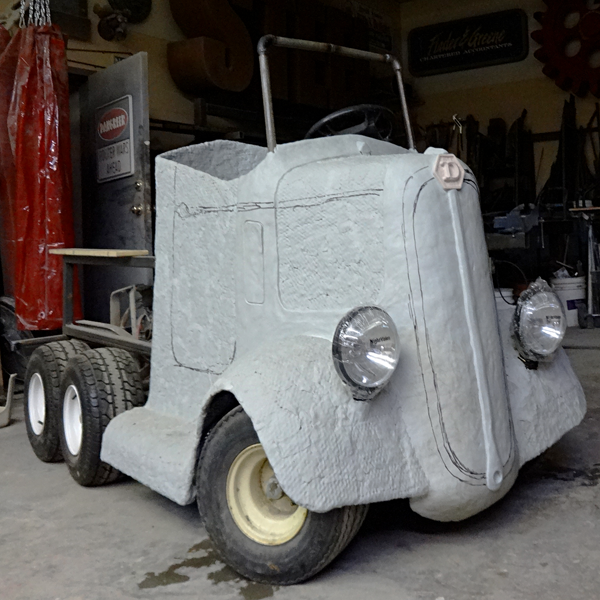 Today we began the final coat of sculpting epoxy on the dump truck cab. The key to sculpting it over a few days is to carefully pick the seam areas. In the case of something like the little truck I purposely allowed the seams to show by doing separate body panels - just as a real car would be built. Today I did the dashboard, cowl, front side panels and the front grill shell. Sarah dutifully mixed the epoxy all day as I applied the sculpt to the body. The truck quickly took shape. Tomorrow I'll sculpt the grill trim pieces and the hood. It won't be long until the test drive.